A student dances during Block 3. The crowd cheered on as GiGi, who GiGi's Playhouse is named after, came on stage and danced. Despite a low-energy start to Block 3, dancers erupted in applause when GiGi — who Dance Marathon beneficiary GiGi’s Playhouse is named after — took the stage. The crowd cheered on as GiGi showed off her dance moves, and Gianni then reminded dancers of the wide reach the beneficiary will have with the funds raised by DM, from developing free educational and therapeutic programs to advocating for speech therapy. 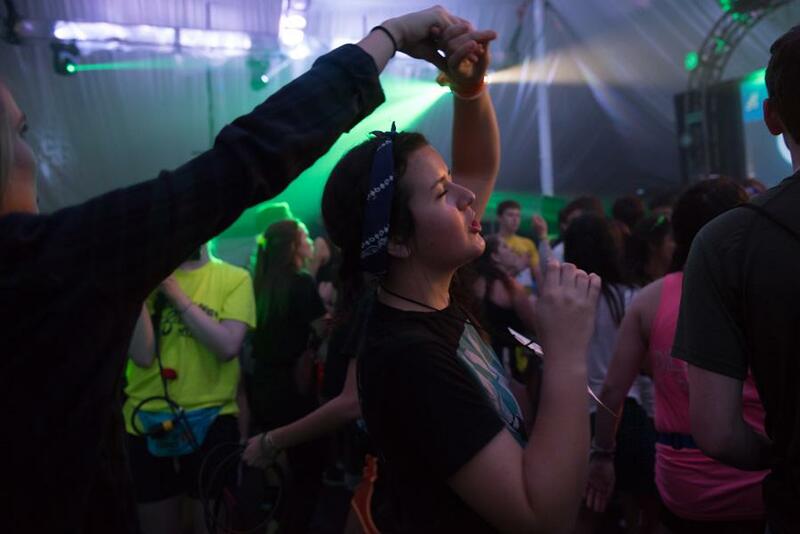 Weinberg sophomore Alex Probst, who is participating in DM for the second time, said Gianni’s speech helped remind students why they devoted a lot of time fundraising and dancing in the tent. “Me and everyone around me were talking about how inspiring (Gianni’s speech) was and how we’re doing this for such a great cause and for such deserving groups of families,” she said. Midway through the block, actress Lisa Kudrow and singer Andra Day appeared in celebrity videos, cheering on the dancers and acknowledging students’ role in promoting social change. Day sang and danced along to the popular Bee Gees song “You Should Be Dancing,” encouraging participants to keep dancing no matter how tired they are. “You guys are changing the world with what you’re doing right here and we love you so much for it,” Day said. Members of the Dancer and Beneficiary Relations committee wrapped up the block with a game of “Ships and Sailors” to get the crowd’s energy up. After about nine hours of dancing, popsicles were handed out at the end of the block as dancers made it closer to the annual sunrise run around Norris University Center.